Michele Cardamone/Special to The Aspen TimesAspen's Kevin Hartmann rounds a gate during the first run in Thursday's Colorado State Ski Championships GS at Aspen Highlands. ASPEN – While he enjoys watching Kevin Hartmann ski, Aspen High alpine coach Craig Carlson admits it also makes him a bit uneasy. Hartmann rode that line to victory in Thursday’s giant slalom at Aspen Highlands on Day 1 of the Colorado State Ski Championships. The Glenwood Springs High School junior, who trains and competes with the Skiers and the Aspen Valley Ski and Snowboard Club, confidently and meticulously attacked the formidable Thunderbowl course. He posted a two-run time of 1 minute, 25.25 seconds – nearly two seconds faster than his nearest competitor. Teammates Xon Baker (1:29.45) and Tyler Nelson (1:32.91) wound up fourth and ninth, respectively, for Aspen, which finished first with 169 points. Rival Summit, which had two skiers crack the top three – Will Cutler (1:27.20) and Ian Parker (1:29.19) – was second, just one point back. The Tigers’ nordic squad more than made up that deficit during the afternoon’s 5-kilometer individual-start classic, outside the AVSC clubhouse. Tucker McCrerey (14:22.1) picked up the win and Jackson Hill (14:42.1) finished fourth for the defending state champions, who compiled a competition-best 170 points. Summit’s two-event total of 338 is eight more than Aspen. On the girls side, the Tigers lead the Skiers, 307-304. The state championships wrap up today with a slalom and a 5-kilometer mass-start skate. Hartmann kicked off Thursday’s action in impressive fashion. He did just that. The effort drew cheers from the Aspen faithful and others; a group of Tigers skiers were among the first to congratulate Hartmann, last year’s slalom winner at the state championships in Summit County. Added Carlson: “That second run was a little more tricky. It definitely was survival of the fittest and came down to who had the determination to make it down the mountain. Some that weren’t attacking it – and their tactics were off a bit – got eaten alive. Hartmann momentarily lost his balance while negotiating a gate about a third of the way down the course. The spot proved difficult for much of the field; first-run leader Danny Graebel of Evergreen lost time and slid all the way to 30th, and Summit’s Dael Moulton, third after the first run, failed to finish – just like Aspen’s Micah Evonitz. Keili Kropf (1:32.50), Sonja Gagen (1:36.81) and Tayler Quist (1:40.08) managed to stay upright, finishing sixth, 19th and 27th, respectively, to lead the Skiers girls to a fifth-place finish with 142 points. Summit (167), which had two in the top three, wound up first and Nederland (158), led by race winner Dayna Larsen (1:27.86), took second. The nordic athletes helped the Aspen girls gain ground on Summit in the classic. Hannah Dodge (sixth), Else Dodge (seventh), Ellie Parker (ninth) and Sophie Stuber (10th) all cracked the top 10. Middle Park’s Samantha Berggren cruised to an easy victory with a time of 17:01.1 – more than 39 seconds faster than her nearest competitor. 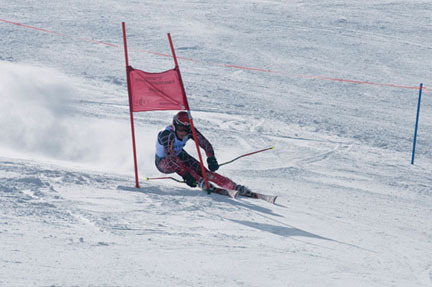 The Skiers boys nearly matched their female teammates’ efforts in the classic. Keegan Swirbul led the way in fifth, Brett Gordon was seventh and Hunter Callahan finished 10th. Hudson McNamee, Riley Heald and Luke Smith wound up 14th, 18th and 19th, respectively.